Something magical and wonderful and beautiful will be happening in charming Asheville, NC next October. Jennifer Hayslip is hosting yet another one of her unforgettable weekend art events! It is a weekend full of fun, laughter, crafting and friendship. There will be no shortage of surprises & visual delights! I can hardly wait! 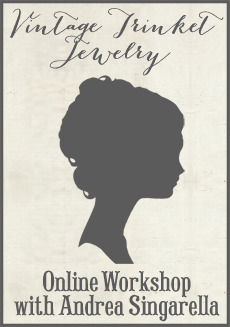 Registration begins in February, and Jenn will have all of the details on her blog. I hope you will join us in Asheville next year for a gorgeous, grown-up fairytale weekend! I realize I've been away for quite a few weeks now, and I appreciate you sweet friends who have checked in on me from time to time with a comment, email or phone call. Life has been extra busy lately, and I'm just trying to work through some challenges and changes. I have missed this place and I have missed my readers. You know you're the reason I do what I do. I certainly wouldn't be blogging away if not a soul was reading my musings. I will be back with more bits of Everyday Beauty when the time is right, although I don't know exactly when that will be. I miss you all! So glad all is well! Enjoy your beautiful children, and we will be here waiting when the time is right for you! God be with you in your days ahead and we'll be waiting and watching for your next posts.I have been checking your blog daily worried about you and your family. While anticipating your next post, I did study your past musings and your creations are the best! We'll be waiting! jenn's event sounds beautiful. congrats on being an instructor. this event is on my radar! Yes, you've been missed...alot! But, don't worry, we're not going anywhere and we'll be patient "followers";) Just do what you need to do, spend time with that beautiful family of yours, and enjoy the busy life. Big hugs to you, Andrea! You HAVE to come through Raleigh on your way to Asheville! Stop by my antique shop and I will roll out the red carpet for you guys!! Your Reader-ellas are still here! So glad to hear from you!! I've been debating about sending a message to be sure all is well. The gathering sounds wonderful - I had seen something about it somewhere and was excited to see you were going to be there. Take care of yourself and as everyone else I'm looking forward to your next post. That looks wonderful!!! What an honor to be chosen as an instructor! But Girl, you totally blow me away with your talent, so I’m not too surprised! Of course I had to look around the blogs of each lady teaching. Wow! What a talented group!! completely understandable! We are all still here, backing you though!! So excited to be able to talk about jenn's event now! Virginia Dodson and I are going!!!! Can't wait!!!!! I left you a voice mail. I wondered how you were Andrea! Sometimes we need to just take a break from the computer... I am so sorry to hear you have been having a few challenges. Life has a way of keeping us on our toes sometimes. How wonderful that you are teaching at Jenns event! I just watch one 4 year old part time, and wonder how all of you moms handle blogging and creating and working and kiddos at the same time! Its impressive! Doesn't Jenn's event sound magical??? She is another impressive mom. Andrea, I have to say, I was worried when I didn't receive an email back from you.... I am hoping everything is alright and you have the strength to deal with the challenges and changes in life you are facing right now. Keeping you in my thoughts, sweet friend and if you need to talk, you know my number. I am just a phone call away. The event sounds lovely and such a beautiful time of year!! Congrats!